I'm working on cleaning up my sewing room. Oh, how funny! Will you post a photo? 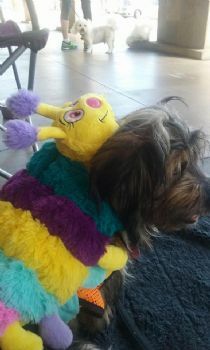 yep that is the one I got for her. She HATES the head part though. lol. 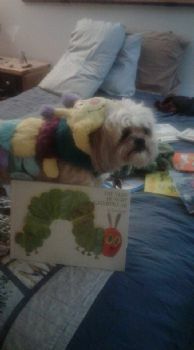 sorted out and organized the dog's costumes (aka therapy dog props). donating about a third of them that don't fit right or that she absolutely hates to wear. of course this was to make room for the new ones I purchased. 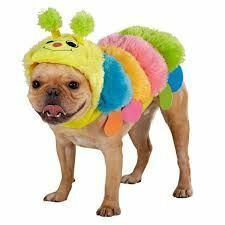 But can't you just picture a little kindergartner reading The Hungry Hungry Caterpillar to a little dog dressed as a caterpillar??!! We'll see how much I get sold. I tend to like that sort of thing. Whatever doesn't get sold goes to the thrift store! Im jealous that your move is over with. Mine is coming up!!! First we sell at least 75% of it in a garage sale! So behind on my cleaning goals. i am doing better at keeping up with daily tasks. i had relatives visiting. everyone stays at my parents. but like a dork i never cleaned up my guest bedroom. when i had company, my house was not clean. oh well. i am hoping once my req ot is done i will be able to do more of it. but untill than , i am working on it. Got my kitchen's 7-drawer file cabinet decluttered a few days ago. Nearly 3/4's of the recycle paper bin filled. Currently working on general tidying of rooms as I change the seasonal decor from summer to fall. the kitchen is finally under control. Just one batch of Tupperware needs to be run through the dishwasher and I shall be happy. Well need to vacuum and mop the floor then I'll be satisfied. Well, we are moving from a house to an apartment and I don't want to bring junk with us! We want to be minimalists no extra baggage! My kitchen cupboards are all scrubbed clean inside & out, decluttered and organized. Yesterday I started on the kitchen 7-drawer file cabinet and have got the first 2 done. Removed quite a bit of paper from them -- things have been stuffed in there for the last 2 years! I've been organizing my mail today. The day before yesterday I cleaned out a shelf and did some emergency laundry and yesterday I had a rest day. You are correct Knuckles - I leave Monday. I'm dreading the long flight - but will have a great 10 day tour. I get back on the 1st so I can start our September thread. My goal is to keep my suitcase neat and organized and try keep organized. Did a load of laundry and I'm still organizing the stuff for packing for my trip. I went to foreign money exchange and picked up the yen I ordered. So, I feel like I'm making progress. Went on a great walk this evening - feels great to enjoy the summer evenings. That sure is a messy place. You've inspired me to do mine, but next week after my daughter gets all moved out! Got the under-the sink cabinets scrubbed, reorganized and decluttered. Those are always the messiest of all as I keep my trash can in one and the compost pail in another. Along with most of my kitchen cleaning supplies. Yeah! WELL DONE EVERYONE! I must admit my backroom took the backseat as my wife was having some medical issues. I will get it done tonight though. Yesterday was laundry day and I also worked on a folder system to keep my documents on my computer organised. I do better with not packing ahead of time. Make a list, yes but not actually starting to pack. Hi All, Sunday evening and I am trying to start packing for a trip. I always stress over this task. I have a list, have my suitcase out, think I have things organized......but just so stressed and need to just start working down the list. Can I share my Blog with you? I AM doing the back room and outside steps!!! Coffee/tea cabinet scrubbed out and reorganized. Two travel mugs and 2 coffee cups out to the donation box and some aged teabags tossed out. Time to tackle the back room tomorrow(Sunday)! unpacked new dishes and boxed up up dishes for donation. all the boxes have been broken down and trash taken care of. taking short break (having breakfast in one of my new bowls) then will wash all the new dishes and put them up. Last night I did the dishes, two loads of laundry and vacuumed up all the clumps of pet hair (they were like tumble weed). Finished my office last night! I spent yesterday organizing some baby things. I'm waiting for a part to come in and hope that will be last of it for a while. Thank goodness I have a great/honest mechanic that I can trust !!! Still hotter than the dickens here, but in reading the news around the world - it seems to be hot everywhere. We even went through our Christmas cards while going through boxes. We hope to get an early start on those. I also found my paper shredder that I got at goodwill. It works like a charm! My office should be finished tonight! I am so excited! Work continues in the kitchen. So far 12 cabinets and 4 drawers cleaned & reorganized. And the microwave cleaned spotless. A little each day. I hope to have mine finished today but in reality it will be more like Saturday with my work schedule. I have some things to do in the garden to shore up my tomato plants! Cleaned my office yesterday.....but was really just procrastinating on the work project I needed to do. Great idea...plus it can be a family affair! I just started my PhD program last week! I am turning my craft room/ turned storage room into an office. That is a HUGE job! Any suggestions appreciated! A new month a fresh start on getting and keeping organized in all facets of our modern lives.